The WV-NS202 features Super Dynamic III and progressive output to create unparalleled high sensitivity and high resolution image reproduction. The highly reliable WV-NS202 features image backup functions and industrial grade mechanisms while remaining cost effective. Designed for professional surveillance applications, the WV-NS202 PTZ network camera is a superior match for your surveillance needs. 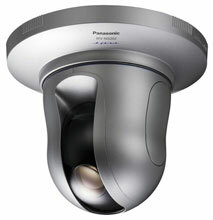 The Panasonic WV-NS202 is also known as PAN-WVNS202	or WVNS202	.